I will say, however, that this is an organized and efficient space now, and I have every intention of it staying this way for awhile. Eventually, our plan is to finish our attic and that will become my craft room. But that is dependent on so many things. For now I'm in our extra bedroom so this means nothing installed on the walls that we'd later need to take down. Anyway, here's what my space looks like after this past weekend. I apologize that these photos are so bad. I am in need of a decent wide angled lens. I used the kit lens and it's pretty distorted at the wide end. This is the view from the door. I think the room is about 12 feet by 14 feet, if I recall correctly the last time I measured. I'd written previously about using some bed risers under one of my Ikea tables because I wanted a counter height workspace. I've moved the table, as you can see, but I still LOVE the bed risers. It's easier on my back and allows for storage underneath. Under the table I have a clear stacking bin system that I got for just $10 (actually, less, this is only 2/3 of it) at the flea market. They were brand new, marked as "drawer liners." I found them after quite a bit of Googling, and found out they all stack together so you can slide one out without the others falling down. They're spacious and perfect for storing my craft supplies. Here's a close up of a few of the bins. I love that I can see exactly what is inside. I cleared out something like 20 or so smaller bins and several cubes and drawers of all of this stuff into this one system that fits nicely under the table. Here's a couple really distorted photos of my Ikea cubes (see how the lines curve? Terrible!). On the top right I have my Big Shot and a $3 metal basket from the flea market to hold my thin metal dies. 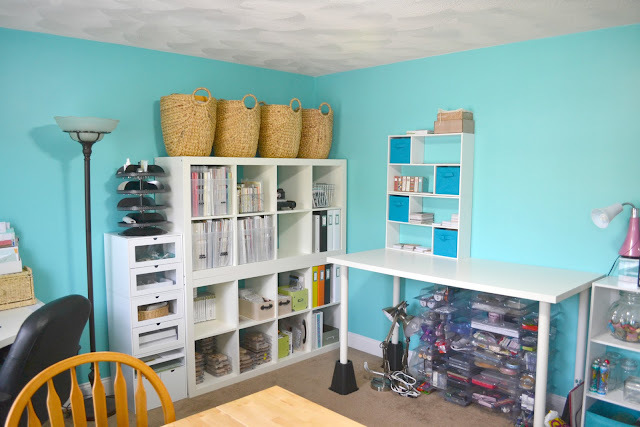 (I have my large Sizzix dies in those plastic sliding bins under the table). 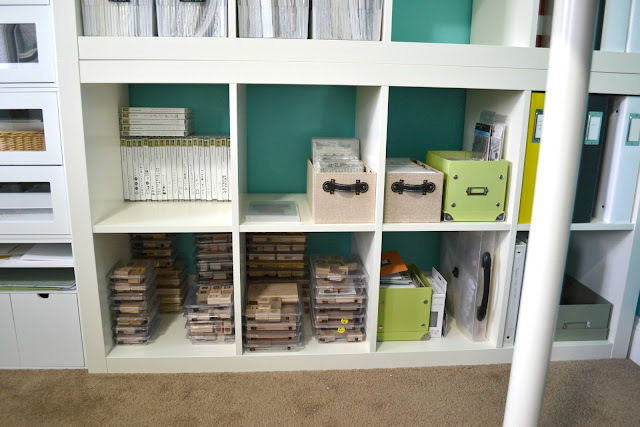 Down on the bottom rows I have all of my Stampin' Up! 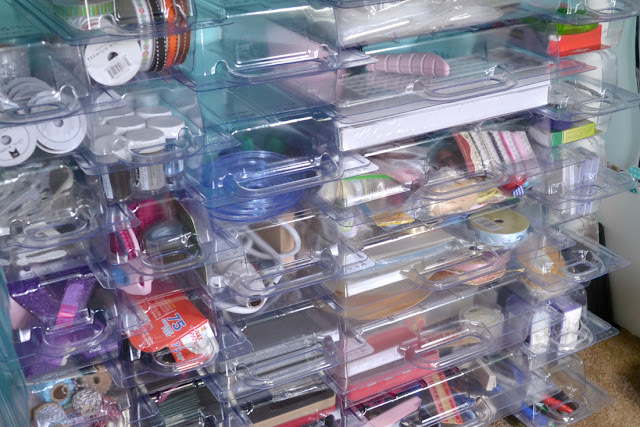 stamps and my clear stamps organized in bins. When I'd moved the Ikea cubes on top of each other, I needed something attractive but useful above them. I found these huge baskets at Christmas Tree Shops. They hold a ton of stuff. I actually have only filled two of them so far. Eventually once they are full I'll be making some hang tags to label them. Right now one holds all of my shipping supplies and another holds all of my chipboard. Over to my work table. I have this Ikea gateleg table that I LOVE. I bought it years ago, back at my old condo, and I won't give it up. It's perfect because when I need space it folds away. 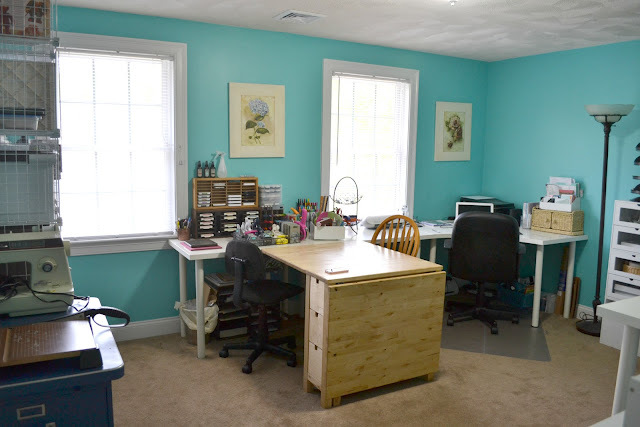 It seats four people comfortably (not that I ever have that many in my craft room at once), and has drawers on both sides. It is SOLID. Heavy wood. Right now I only have half open (I'll open the other half when Lindsay or Shannon come over to craft) so I can walk around easier in the room. Plus, I only need half the space to work and when I open the entire table I find I can easily clutter it with stuff. I set up a "card making" station on another Ikea table right next to the desk. I actually have two of these table next to each other. 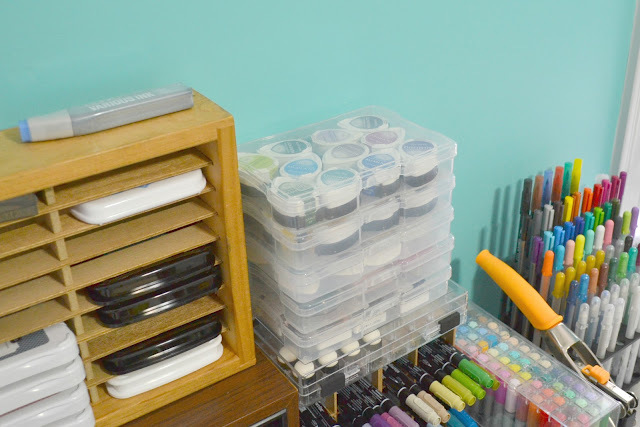 On this table, I wanted easy access to my inks, my markers, and most especially, punches. I had my punches in a drawer previously and found I wasn't using them enough. This past weekend I found a metal basket at the flea market for $1, and it is perfect! I can see the punches I should be using or want to be using easy and they're all contained in the basket. I can move it aside if I need extra space. I actually do have more punches than this, but the rest are either really big, or seasonal, so I've tucked those away in my drawer. 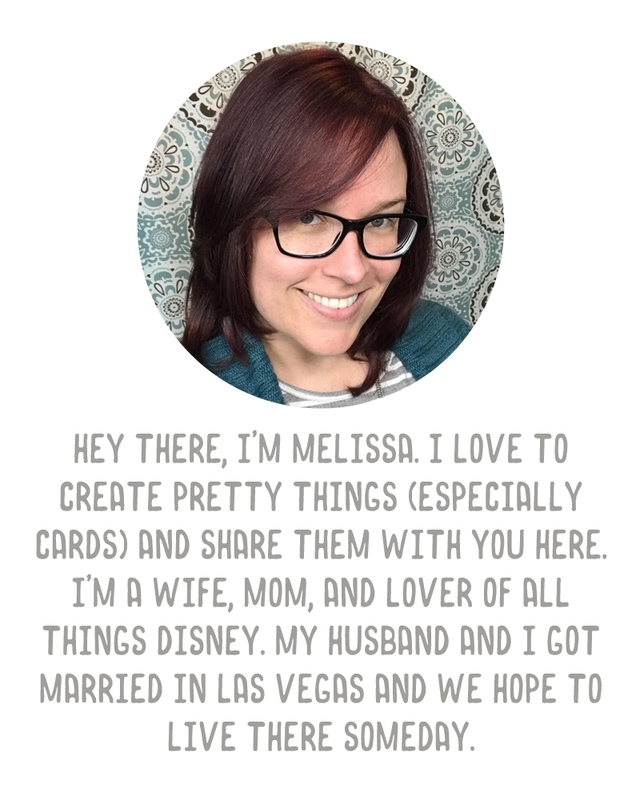 I put my Stampin' Up! ink spots and my Memento teardrop ink spots into these Iris photo containers. They fit several of them perfectly and I can see which colors are in there through the tops. 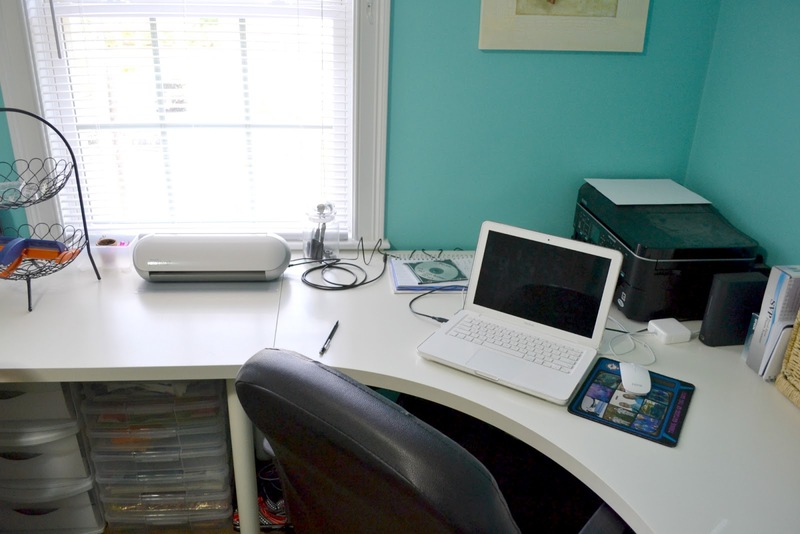 The Ikea tables I mentioned above line up with another Ikea corner table where I have my Mac and my Silhouette and Epson Workforce printer. Finally, I kept the Project Life station I'd discussed here, but I moved it when I moved the table. I've got the sticker stadium on top of a 9 cube organizer, along with a Recollections drawer/filing thing from Michaels. I also added two small cube systems from Target to the table, where I'll be housing all of my journaling cards. (That, by the way, is a project I'm in the middle of that I'll post about later on when it is finished). I love this set up. It looks super functional but breathable. Your room looks awesome!!! 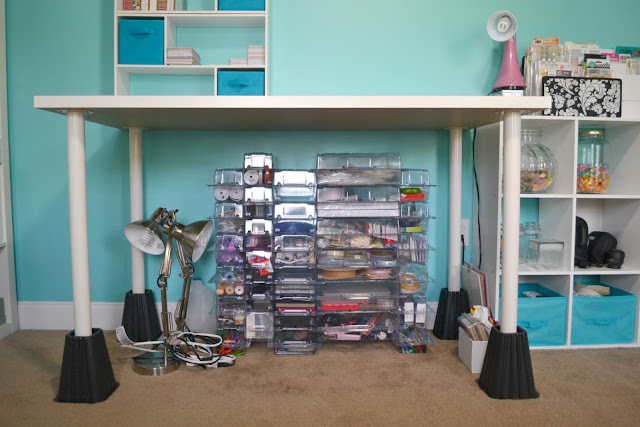 Love those storage baskets and your clear bins. 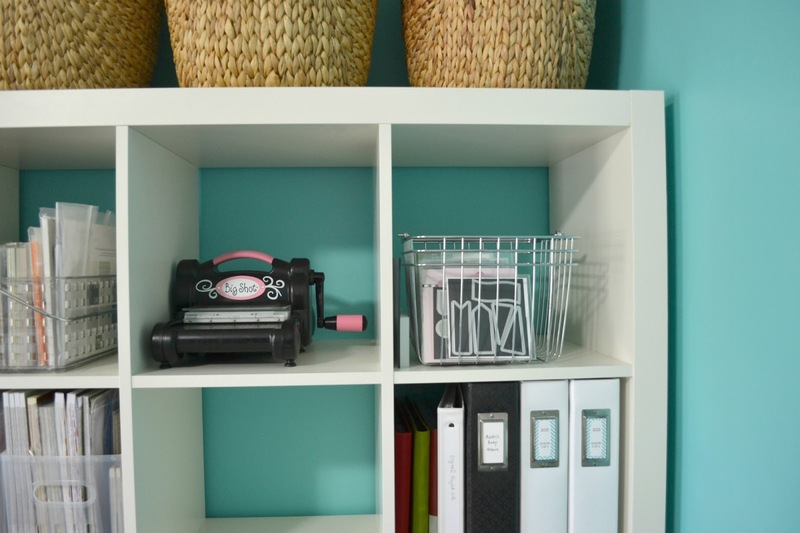 All very cool touches that will help you stay organized. 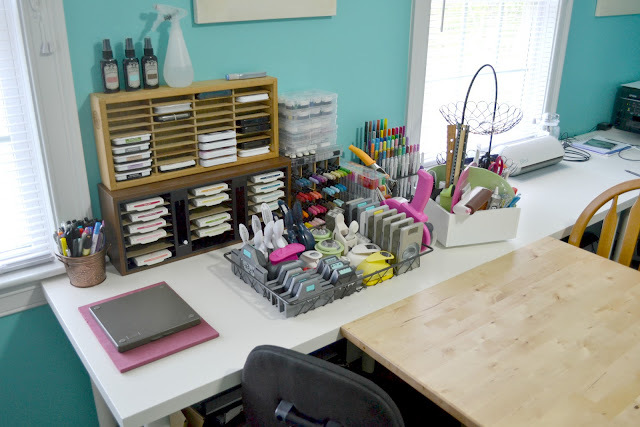 We crafters do love organization, don't we??? You have a great set up :) I love seeing other people's spaces, thanks for sharing! Thank you! 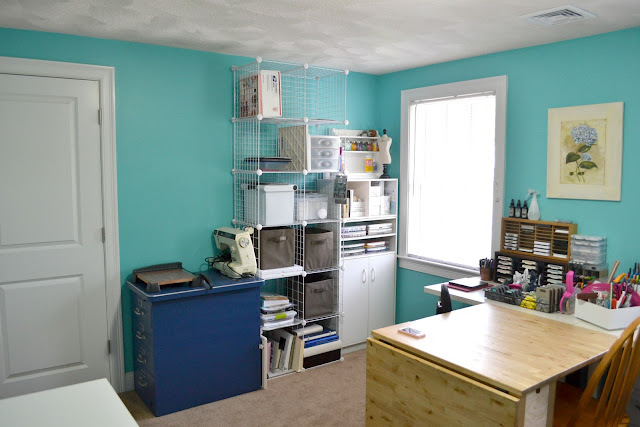 I love looking at other craft rooms too. I could spend days doing that! 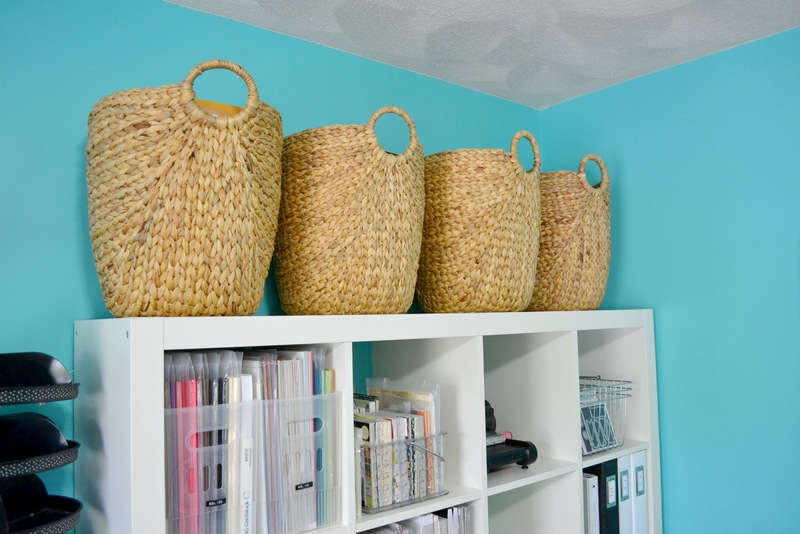 I am forever looking for this metal wire basket crates & only ever find them for like $25! Cannot believe you find them at flea markets for only a few bucks. Gaaah! 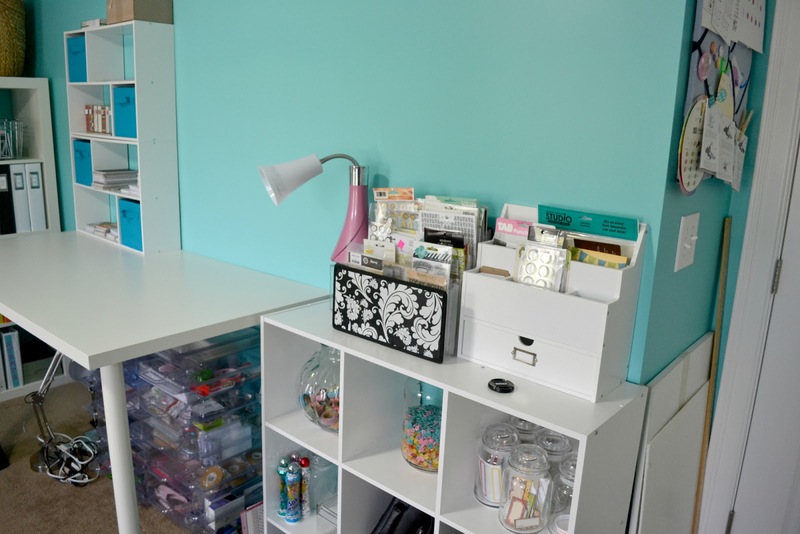 Wow it's tidy and so organised with such a good amount of stuff.